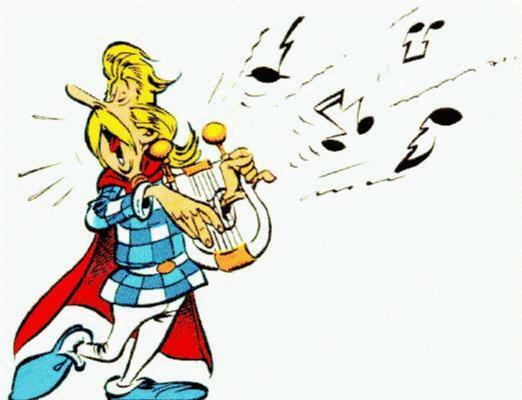 In the Asterix books, Cacofonix the bard is forbidden to sing because his voice causes wild boar, villagers, Normans and Romans alike to flee. 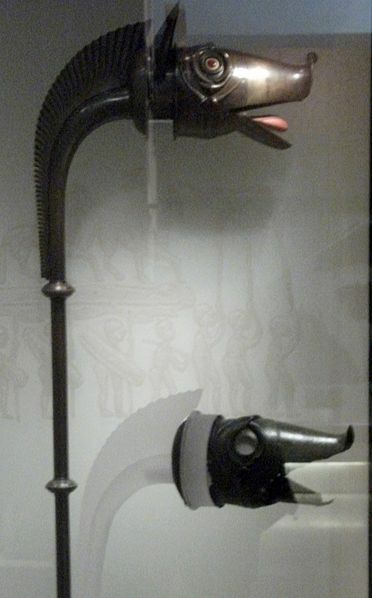 But Cacofonix does play the carnyx, a long, slender trumpet-like instrument decorated with an animal’s head at the top end, and used by the Celts in the last three centuries BC. The Greek historian Polybius (206-126BC) was so impressed by the clamour of the Gallic army and the sound of the carnyx, he observed that, “there were countless trumpeters and horn blowers and since the whole army was shouting its war cries at the same time there was such a confused sound that the noise seemed to come not only from the trumpeters and the soldiers but also from the countryside which was joining in the echo“. When the remains of seven carnyx were unearthed recently, Christophe Maniquet, an archaeologist at Inrap, the national institute for preventive archaeological research (Institut National de Recherches Archéologiques Préventives), was curious to find out exactly what sound it produced when it drove the Romans mad, or was used to call upon the god Toutatis. In 2004, more than 500 iron and bronze items placed as offerings to the gods were discovered a small 30cm-deep pit in Tintignac, in the Corrèze department. “These items were deliberately damaged so that they could not be used again by mere mortals,” said Maniquet. 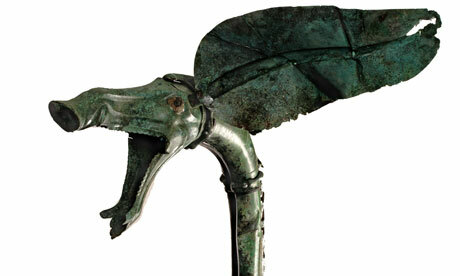 Some 40 fragments were identified as being parts of a carnyx, making it possible to restore a tall, 1.8-metre-long instrument with a stylised boar head at the top – a first in archaeology. “Some carnyx pieces were discovered in England, Scotland, Germany and Italy, mainly in the 19th century, but the context was unclear and we have never found so many instruments in one go,” said Maniquet. The carnyx is a wind instrument, part of a sub-family of brass instruments defined by the presence of a mouthpiece. The sub-sub family would be natural brass instruments without valves. With its conical shape the carnyx resembles a soft brass instrument like the horn, with a more muffled sound than a cylindrical trumpet-like brass instrument. Unfortunately since it was impossible to play the instruments the pious Gauls had so carefully dismantled, Maniquet asked an instrument maker to reproduce a brass carnyx of the same size. The archaeologist worked with experts from the acoustics laboratory at the Maine-CNRS University in Le Mans, headed by Joël Gilbert, a brass instruments specialist, who carried out an in-depth analysis of the specimen. A study presented by a group of researchers and instrument makers in Le Mans last month, revealed that the resonance frequency determined the series of playable notes. In a well-designed instrument this resembles a harmonic series. If the musician had the base note he could easily produce others (mainly octaves, fifths and thirds), by modulating air flow and lip tension. Leichestown Deskford carnyx & reconstruction. Museum of Scotland. The carnyx has a fairly low base note because of its length but researchers found that the resonance frequencies obtained with the copy of the carnyx were far from harmonic. According to Gilbert, when he and his colleagues looked into this they suddenly had an idea. “The carnyx is not a primitive instrument and it was known for being very powerful. We therefore worked on the hypothesis that our copy was incomplete,” he said. Maniquet believes that is quite plausible, especially since no one is really sure how the mouthpiece connects to the tube. The acoustics experts have pursued their research by doing simulations with a mathematical model, this time adding an additional part to a virtual carnyx. They tested two lengths, 10cm and 20cm, which produced a lower sound and altered the resonance harmony. The simulations showed that the optimum length was achieved by adding a 10cm part, which could match an item in the catalogue of finds from the Tintignac site. Maniquet is now planning to build a second prototype instrument to include the additional 10cm. “That should make this carnyx more powerful and easier to play,” said Gilbert, confident that his calculations are correct. Cacofonix can remain gagged; it seems that relief is on its way. German experts are carefully taking apart a complete Celtic grave in the hope of finding out more about the Celts’ way of life, 2,600 years ago, in their Danube heartland. It wasn’t the most glorious final journey for an aristocratic Celtic lady who, in life, clearly had a bit of style. She died just over 2,600 years ago and rested in peace until a few months ago when her grave was dug up in its entirety – all 80 tonnes of it – and transported on the back of a truck through countless German towns. When the truck arrived, the grave encased almost entirely in concrete, was unloaded and a tent constructed around it. The archaeologists decided that removal of the whole grave would allow them to use the most modern resources of analysis, from computers to X-rays. From the gantry above a pit, archaeologists leant down and scraped the earth from the bones and jewels speck-by-speck. What emerged was the lady, the child and their ornaments. “It is the oldest princely female grave yet from the Celtic world,” said Dr Dirk Krausse, who is in charge of the dig. The grave had also not been robbed down those 26 centuries, unlike many others. This means that the jewellery is still there, particularly beautiful brooches of ornate Celtic design in gold and in amber. 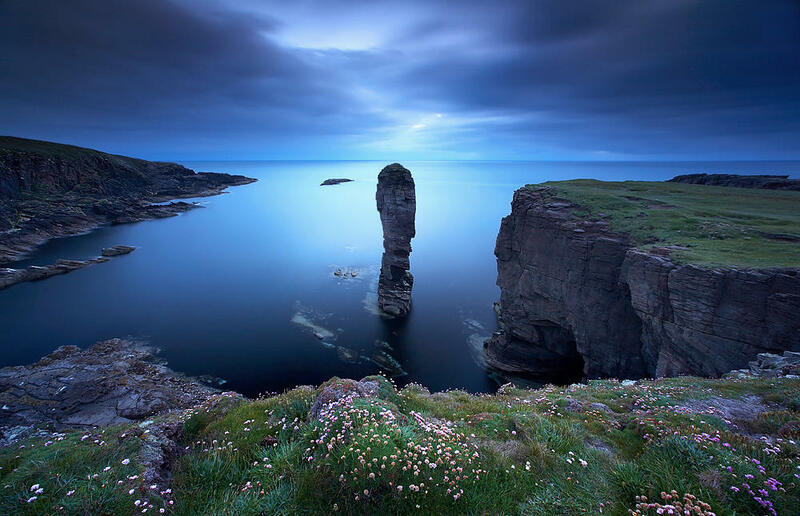 We usually think of the Celtic heartland as the western edges of Europe – Wales, Scotland and Ireland and Brittany in France. 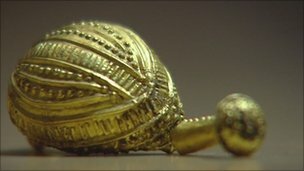 “Celtic art and Celtic culture have their origins in south-western Germany, eastern France and Switzerland and spread from there to other parts of Europe,” said Dr Krausse. From the gantry above the grave, Nicole Ebenger-Rest has been doing much of the painstaking excavation. As well as the rings and brooches, she uncovered the teeth of the Celtic princess. But what also excited her were specks of cloth or food or other organic matter which might reveal a way of life. “It is a skeleton but it’s still a human being so you have a natural respect,” she said, looking her fellow human being in the face, across the divide of 26 centuries. The subterranean chamber measuring four by five meters was uncovered near the prehistoric Heuneburg hill fort near the town of Herbertingen in south-western Germany. Its contents including the oak floor of the room are unusually well preserved. The find is a “milestone for the reconstruction of the social history of the Celts,” archeologist Dirk Krausse, the director of the dig, said on Tuesday. 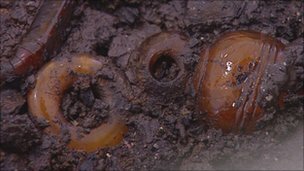 The mass burial took place at a time when the English were battling Viking invaders, say archaeologists who are now trying to verify the identity of the slain. The dead are thought to have been war captives, possibly Vikings, whose heads were hacked off with swords or axes, according to excavation leader David Score of Oxford Archaeology, an archaeological-services company. Many of the skeletons have deep cut marks to the skull and jaw as well as the neck. “The majority seem to have taken multiple blows,” Score said. The bodies show few signs of other trauma, suggesting the men were alive when beheaded. One victim appears to have raised an arm in self-defense: “The hand appears to have had its fingers sliced through,” Score noted. The heads were neatly piled to one side of the pit, perhaps as a victory display, the team suggests. Even if their weapons and valuables had been taken “we should have found bone buttons and things like that, but to date we’ve got absolutely nothing,” Score said. The burial has been radiocarbon-dated between A.D. 890 and 1034. During this time England was split between Anglo-Saxons, in the south and west, and Danish settlers, in the north and east. The Anglo-Saxons were Germanic peoples who colonized England beginning in the 400s; founded the country on the island of Great Britain; and gave rise to the English language. Around the time of the mass burial, the Celts were still largely in control of the non-English regions of Great Britain: Scotland and Wales. “You’ve got Danish and Saxon armies fighting backwards and forwards across England,” Score said. The early English also faced the threat of longship-sailing Vikings, Scandinavian seafarers who pillaged coastal regions. Wear and tear on the bones could also help reveal whether the executed were Viking oarsmen, since “strong physical exertion in a particular direction does affect the bones,” Score said. The burial’s prominent location on a hilltop hints that a local group carried out the killings, Score said. 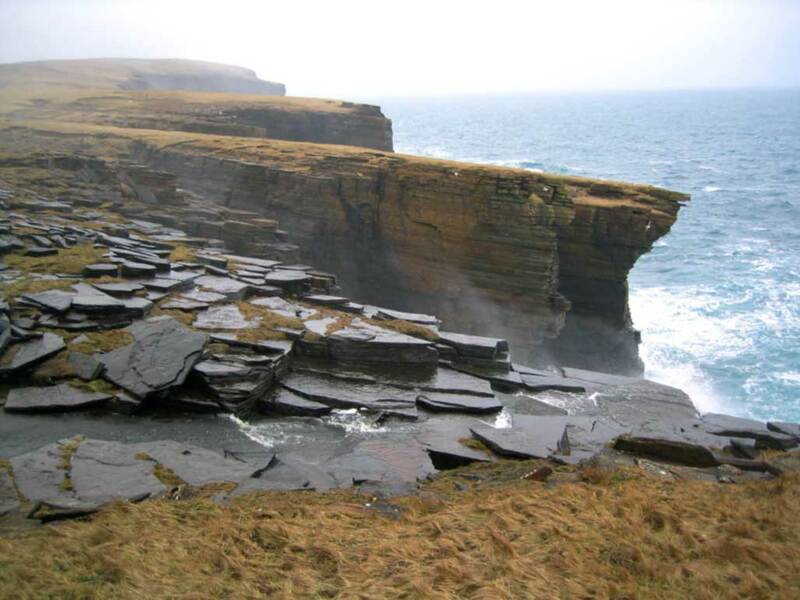 “Locations like this are classic sites for executions in late Saxon and medieval times,” he added. Vikings, he said, had a different M.O. “If you’re a Viking raider, you’re much more likely to leave people where you killed them in the town or on the beach,” he said. Kim Siddorn, author of Viking Weapons and Warfare, suspects the executed men were indeed Vikings. “I would say this was a Viking raiding party which had been trapped,” he said. There was little to differentiate Vikings and early English warriors on the battlefield, said Siddorn, founder of Regia Anglorum, a historical-reenactment society. Both used spears as their primary weapons, with swords and axes as backups, Siddorn added. But Vikings had surprise and, in some cases, numbers on their side. 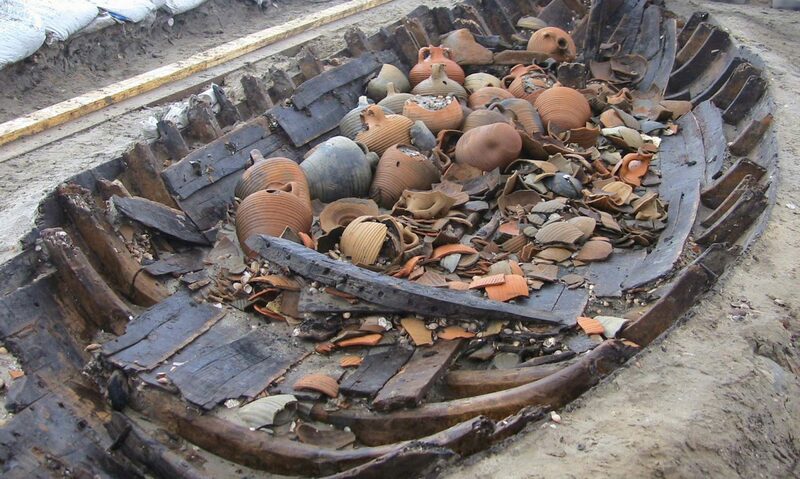 “Whilst the Vikings were no better than the Saxons at fighting, they did come by the shipload,” he said.